The 2001 Nisqually earthquake occurred at 10:54:32 local time on February 28, 2001. The intraslab earthquake had a moment magnitude of 6.8 and a maximum Mercalli intensity of VIII (Severe). The epicenter was in the southern Puget Sound, northeast of Olympia, but the shock was felt in Oregon, Canada, eastern Washington, and Idaho. This was one of several large earthquakes that occurred in the Puget Sound region in the prior 52 years and caused property damage valued at between one and four billion dollars. One person died of a heart attack and several hundred were injured. 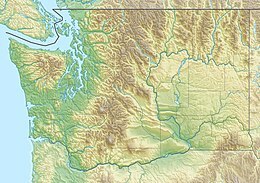 The Puget Sound area is prone to deep earthquakes due to the Juan de Fuca tectonic plate's subduction under the North American Plate at 3.5 to 4.5 cm a year as part of the Cascadia subduction zone, which causes stress in the North American Plate as the Juan de Fuca Plate sinks into the mantle. Similar significant earthquakes occurred in the same general region on April 29, 1965 (magnitude 6.7, depth 59 km (37 mi)), and April 13, 1949 (magnitude 6.7, depth 50 km (31 mi)). A large van was crushed by bricks in a Seattle parking lot. Although there were no directly-related deaths, local news outlets reported that there was one death from a heart attack. About 400 people were injured. Most of the property damage occurred very near the epicenter or in unreinforced concrete or masonry buildings, such as those in the First Hill, Pioneer Square and Sodo neighborhoods of Seattle. The Trinity Parish Church on First Hill was severely damaged. The air traffic control tower at Sea–Tac Airport was heavily damaged; it has since been replaced with a more earthquake-resistant tower. The quake splintered a buttress under the dome of the capitol building in Olympia, but previous earthquake-resistance work prevented more serious harm to the building. Additionally, power outages affected downtown Seattle. The U.S. Military's Ft. Lewis and McChord Air Force Base received damage and there was very slight damage in Victoria, British Columbia. 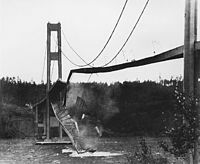 The Fourth Avenue Bridge in Olympia was severely damaged. In the fore-ground is a piling for a temporary bridge. Following the quake, many buildings and structures in the area were closed temporarily for inspection. This included several bridges, all state offices in Olympia, and Boeing's factories in the Seattle area. Various schools in the state also closed for the day. 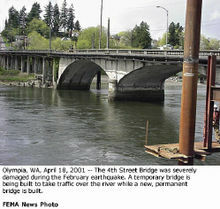 The Fourth Avenue Bridge in downtown Olympia was heavily damaged and was later torn down and re-built. In Seattle, the Alaskan Way Viaduct and its seawall were damaged, forcing the viaduct to close for emergency repairs and ultimately factoring into the decision to replace the viaduct entirely. Approximately $305 million of insured losses and a total of $2 billion worth of damage was caused in the state of Washington. The area was declared a natural disaster area by president George W. Bush and was therefore able to receive federal recovery assistance. The number of businesses in the heavily affected region was relatively small. At least 20% of businesses surrounding the heavily affected area took direct losses, while 2% had direct losses of over $10,000. None of these businesses received money for direct damage from federal aid or insurance. Many businesses did not receive any aid at all. Those that did receive aid had no help with indirect losses. Indirect losses varied from inventory or data corruption, disruption in the workplace, productivity, etc. Data and inventory losses were possibly the most damaging, especially for retail stores. Retail stores lost inventory as well as people's interest for a period of time after the quake. One of the vital elements to prevent damage and injury were well structured buildings. This can prevent the loss of life as well as inventory. Businesses that did not sustain very much damage also gained a sense of security that may be unreliable as the moment magnitude was high but the hypocenter was deep under the earth. This earthquake was a 6.8 moment magnitude that caused $2 billion damage while the Northridge earthquake was a 6.7 moment magnitude, but caused more than $20 billion worth of damage as the hypocenter of the Northridge earthquake was much shallower and closer to the surface of the earth. Named after the Nisqually Delta, this earthquake hit the southern end of Puget Sound causing damage to the ports of Seattle and Tacoma. In the month following the earthquake, the National Oceanic and Atmospheric Administration and the USGS assembled a team to map the bathymetry of the deltas near the epicenter. This revealed multiple submarine failures on the Puyallup and Duwamish delta fronts. In other areas liquefaction, sand boils, landslides, and soil slumping occurred. Liquefaction was also determined to be a main contributor to increased stream flows. With multiple stream gauges collecting data before and after the earthquake there was a regular pattern of higher increased stream flow around areas where liquefaction occurred. Soil liquefaction was also observed at a wildlife refuge causing damage to the buildings within. A rapid response plan was developed a year later. The region realized how they avoided a potential extremely damaging catastrophe. Many businesses, organizations, hospitals, etc. were asked to sign a regional disaster plan. This would allow disaster relief teams to locate and aid places much faster than before. It would also be able to direct limited resources to places with greatest immediate need. Wikimedia Commons has media related to 2001 Nisqually earthquake. ^ a b USGS. "M6.8 - Puget Sound region, Washington". United States Geological Survey. ^ a b c "A Comparison of the February 28, 2001, Nisqually, Washington, and January 17, 1994, Northridge, California Earthquakes". Southern California Earthquake Center. ^ Highland, Lynn M. (2002). An Account of Preliminary Landslide Damage and Losses Resulting from the February 28, 2001, Nisqually, Washington, Earthquake. U.S. Geological Survey. Retrieved August 15, 2009. ^ David Postman (March 5, 2001). "Capitol did 'remarkably well'". The Seattle Times. Retrieved May 16, 2012. ^ Linn, Allison (February 28, 2001). "Bill Gates speech interrupted by quake". The Associated Press. Retrieved March 30, 2007. ^ Earthquakes Canada – Report (2001-02-28). Accessed January 23, 2009. ^ "Fourth Avenue bridge: Bridge over rubbled water". The Olympian. 2002. Archived from the original on November 3, 2001. Retrieved July 30, 2008. ^ "Quake Capsules-Fourth Avenue Bridge". The Olympian. September 2, 2001. Archived from the original on November 21, 2001. Retrieved July 30, 2008. ^ "About the Alaskan Way Viaduct and Seawall". WSDOT. Archived from the original on August 29, 2012. Retrieved May 16, 2012. ^ "Resilient Washington State" (PDF). Archived from the original (PDF) on April 7, 2014. Retrieved April 1, 2014. ^ a b Nisqually Basin Bibliography: Science, Resource Management, Land Use, and Public Policy. ^ "On Nisqually Quake anniversary, region set to adopt rapid response pact; County repairs damage". Archived from the original on January 24, 2012. Retrieved April 1, 2014. This page was last edited on 29 March 2019, at 16:19 (UTC).